David Bowie was a man of class, grace and exceptional talent. The last few months of his public life were focused on the release of his final album Blackstar, and the opening of the off-Broadway show Lazarus, rather than the cancer he fought privately. He lived his separate lives, as ever-changing performer David Bowie, and in private as David Jones. I mourn the man who was shared with us, the artist. The beautiful thing about Bowie is that his music will remain. We have fifty years of music to savor and enjoy. Above all, we must remember that we are not his loved ones. A light has gone out in our world, but in theirs it is one that burned more brightly. Bowie’s legacy shows a true artist, a chameleon who worked and created until the very end. Blackstar is a remarkable album, combining Bowie’s love of jazz and his unique vocals with a profound meditation on mortality. It’s a harsh yet elegant end to his brilliant career. David Jones may have passed from this world. David Bowie has ascended to the stars, to live on as a legend. The Bookshop Band performs Routing for Loki, inspired by Joanne M Harris’ The Gospel of Loki. New favorite song. I’m a mythology hipster, I’ve loved Loki since before he was cool…seriously, try something like 16+ years. 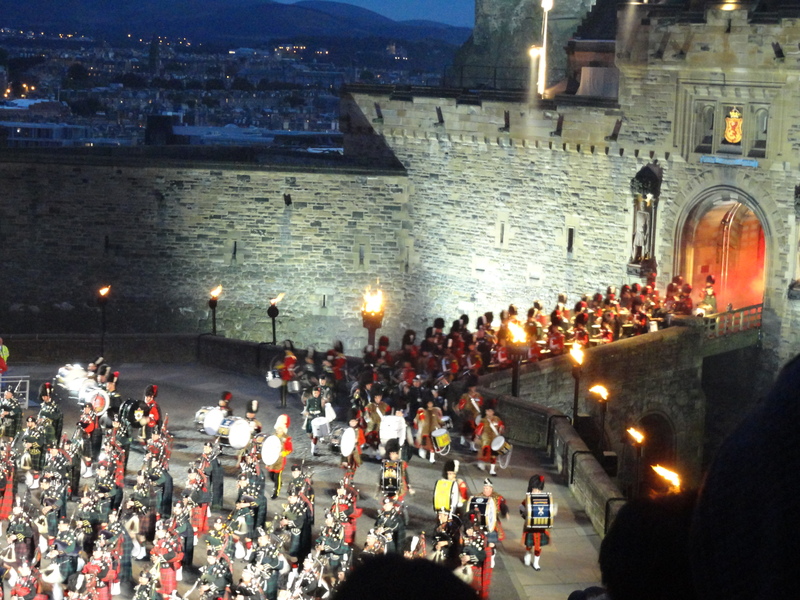 Last night, my dad and I went to the Royal Edinburgh Military Tattoo. We’ve talked about going to this event for years, since I started playing the bagpipes back in the early 2000s (I don’t play any more). Finally, circumstances brought us to Edinburgh (well, my living here and his being in Scotland for work). Around 8.30, we joined the throng walking up the Royal Mile, the maddening bunch of tourists, a few locals, masses of students. I felt a bit like a salmon swimming up river, particularly as I had to go up hill to get to the Castle Esplanade. It was chilly, a sharp contrast to the day’s comfortable weather and Saturday night’s warmth. Sitting up where we were, it was slightly windy, but not nearly so bad as on top of the seats–the flags flew wildly. The Tattoo started at 9 with a fighter jet flyover, which I unfortunately could not see. Not a real loss though, we could hear the four jets. They fly over the Meadows, and I’ve seen them fly by before. I didn’t really know what to expect from the Tattoo. 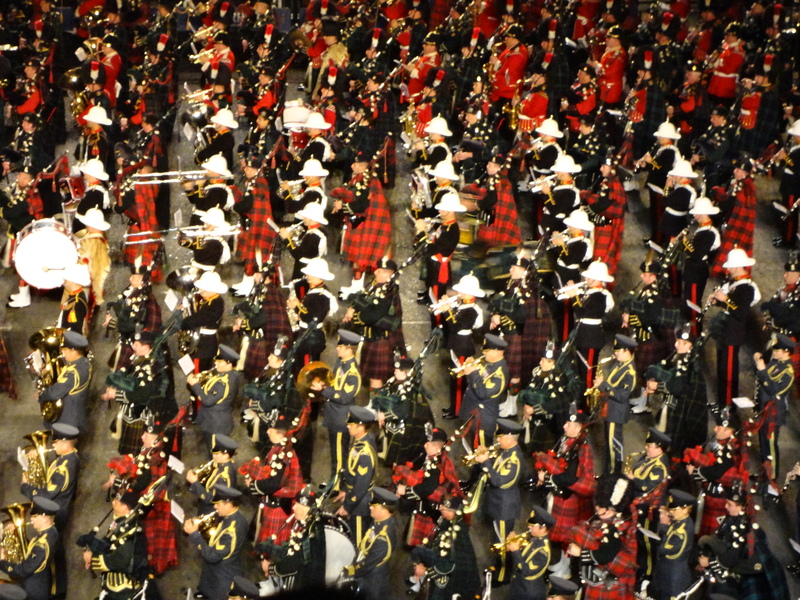 Bagpipes, obviously, military bands, yep. Highland dancing mixed with modern dance to interpret the Industrial Revolution? Nope, did not expect that–nor did I particularly enjoy it. It was entertaining and shiny, but, quite frankly, watching modernish dance bores me a bit. As does ballet, to a degree. I digress. 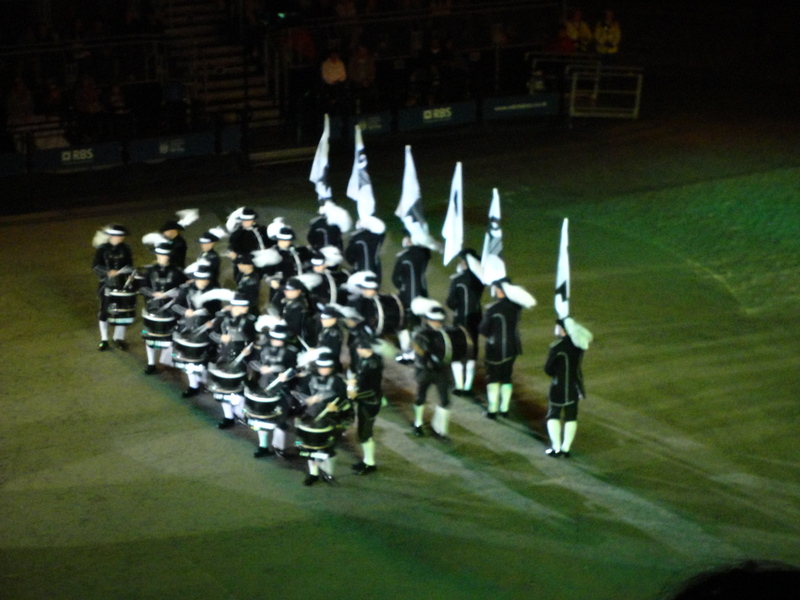 My favourite part of the evening was when the Top Secret Drum Corps of Basel, Switzerland. I had seen a video of their 2006 performance and was hopinghopinghoping that they would be performing at this year’s Tattoo. Lo and behold, they were! It was a fantastic performance. I grinned ear to ear the whole time. “You’re really enjoying this, aren’t you?” my dad said to me during the drum-stick-stage-fighting portion. I could only nod. After the Top Secret Drum Corps came the King of Norway’s personal guard, a fantastic drill team and band. 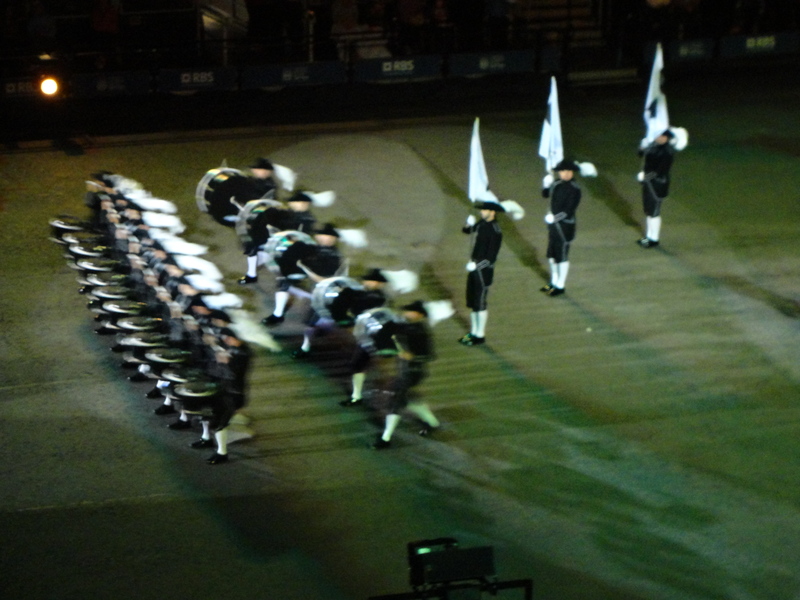 I like the patterns and movements created by drill teams, the precision and exactness (a bit strange that I can be bored watching choreographed dance and yet I really enjoy drum lines and drill teams…oh well). 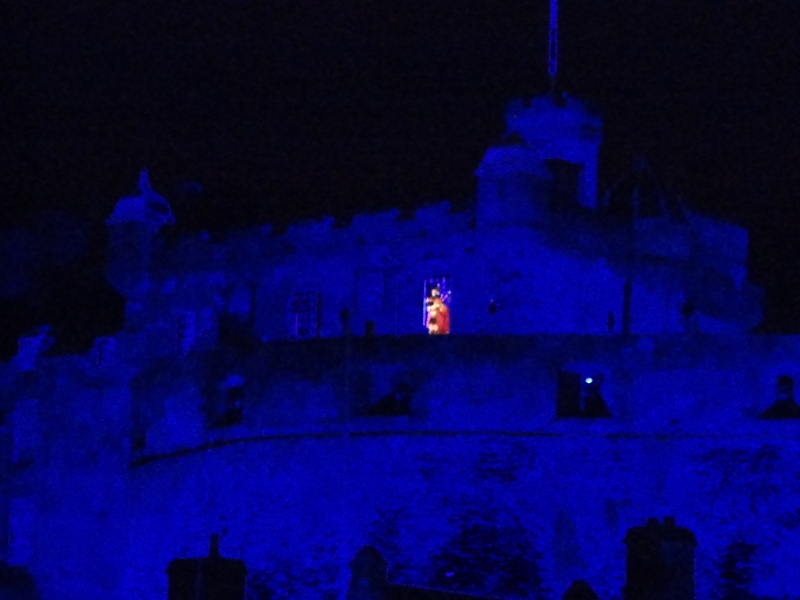 The Tattoo ended with the lone piper on the Castle ramparts, playing a hymn for the fallen.